Streamline the deployment and management of desktops by delivering desktops as a managed service. 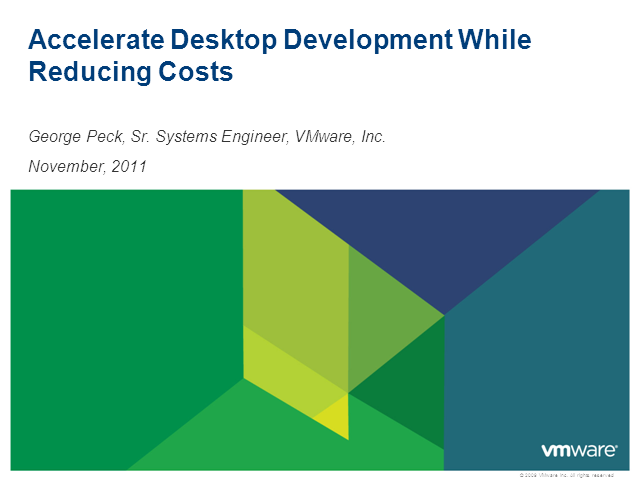 Deploy virtual desktops to both local and remote users and cut desktop costs by up to 50%. Bring business continuity and disaster recovery solutions to the desktop by eliminating concerns of planned and unplanned downtime. Ensure compliance and a great user experience while retaining business agility and improving desktop management. Let your desktops take advantage of key features in the vSphere platform such as vMotion, High Availability, Dynamic Resource Scheduler and Consolidated Backup. Access virtual desktop from a wide variety of devices over any network connection to ensure business continuity. Quickly provision virtual desktops to remote users or groups of users in the event of a pandemic or catastrophic event when it is difficult for workers to access the office. Keep desktops running even when server hardware goes down with automated failover and recovery. Shift desktop computing resources automatically as user needs and application loads change with dynamic load balancing. Give remote users a high performance desktop experience with VMware View with PCoIP while protecting access to sensitive data. BONUS: How to put your Stimulus Dollars to Work for Your Organization and the Environment! A Government Focused Initiative!